This is the third of a series of posts detailing mine and my sister’s trip to New Zealand’s North Island. View all the posts so far here. 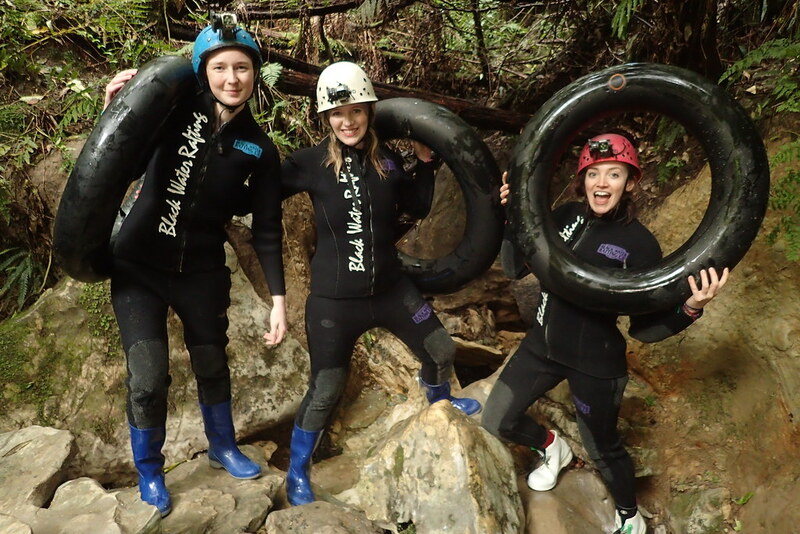 I’m not going to lie – venturing into a glow worm cave in Waitomo with Black Water Rafting Co. is one of the scariest things I’ve ever done. 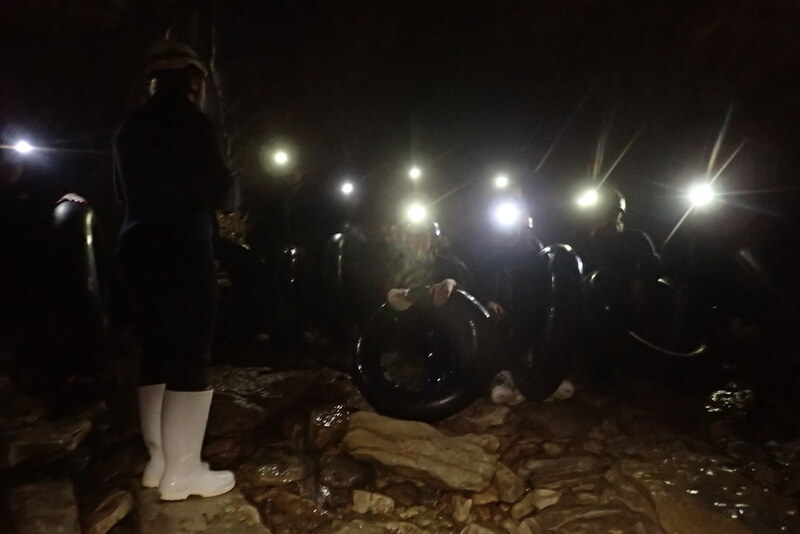 Jumping backwards, off a waterfall, in the dark, between jagged rocks, 65 metres underground, my flimsy rubber ring failing to keep me from going under the black water… is something I never want to do again. But the otherworldly pay-off was so amazing that, in the end, it was worth it. Tama and I left Auckland on the 7am Intercity bus, on which we sat behind Jess who we’d met on Waiheke Island yesterday. 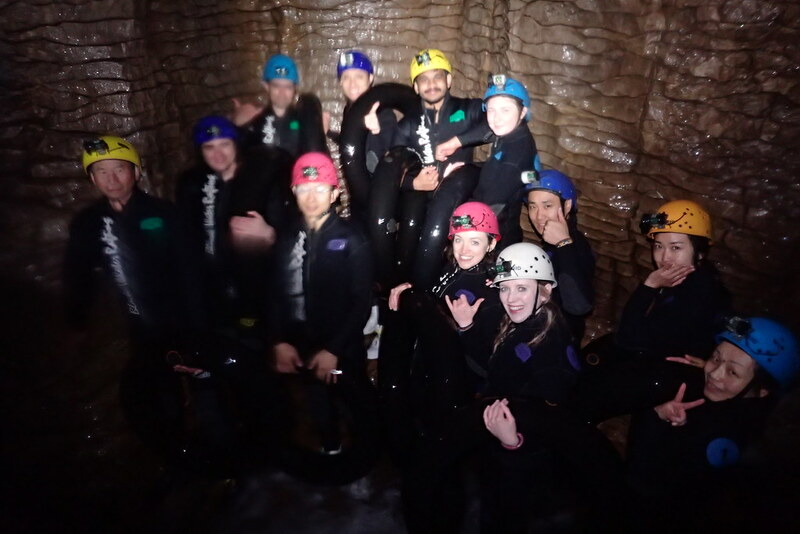 After around three and a half hours’ on the bus, us three and a few others were dropped off at Black Water Rafting Co.’s office while the rest of the bus continued on to do the nice, safe, relaxed boat ride through Waitomo glow worm caves… a very different activity to ours, which was called ‘Black Labyrinth’. After we’d put our luggage into storage, our guides introduced themselves. We learnt quickly that while one of them was nice and patient, the other seemed mean and impatient – she made me feel more on edge than I was already. I was very glad to have the other there to reassure me. 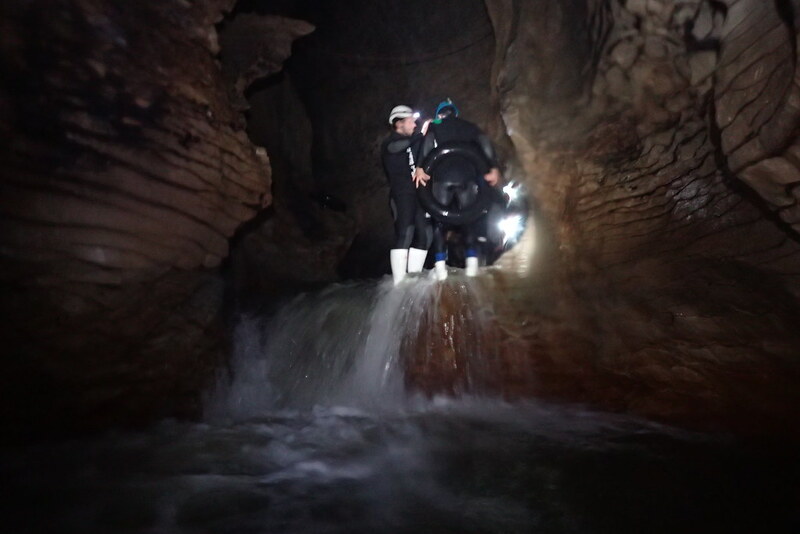 Our guides took us down to the yard, where we were given wetsuits and rubber boots to change into. I’d never worn a wetsuit before, and it felt like the strangest thing ever! 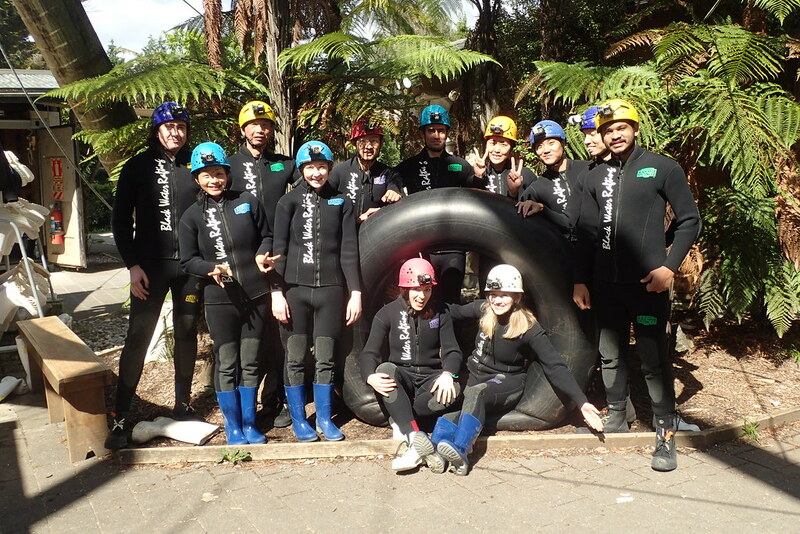 Once we’d suited up we took some group photos and piled into a minibus to be driven to Ruakari Cave. 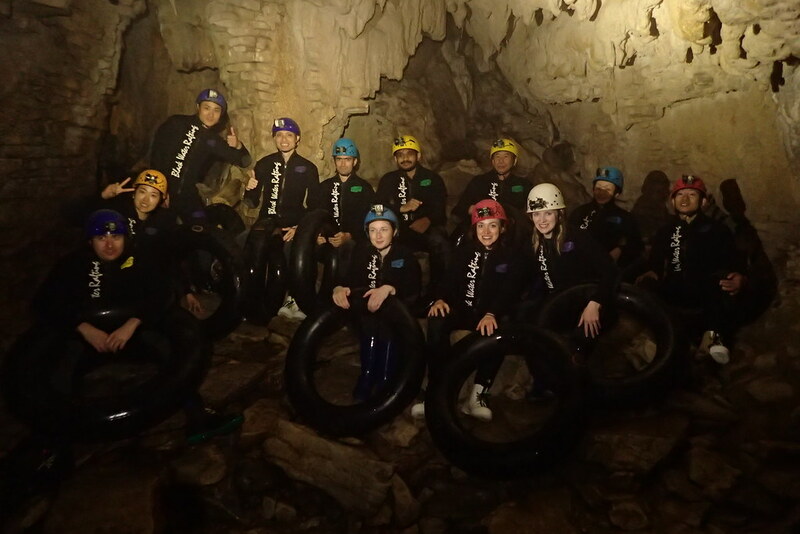 To save any confusion, Ruakari cave is in Waitomo but it’s different to Waitomo cave: Ruakari is more natural and much less commercialised, but has just as many glow worms! Outside Ruakari cave we were given a large rubber ring each and told to pose for more photos. So far, so good. 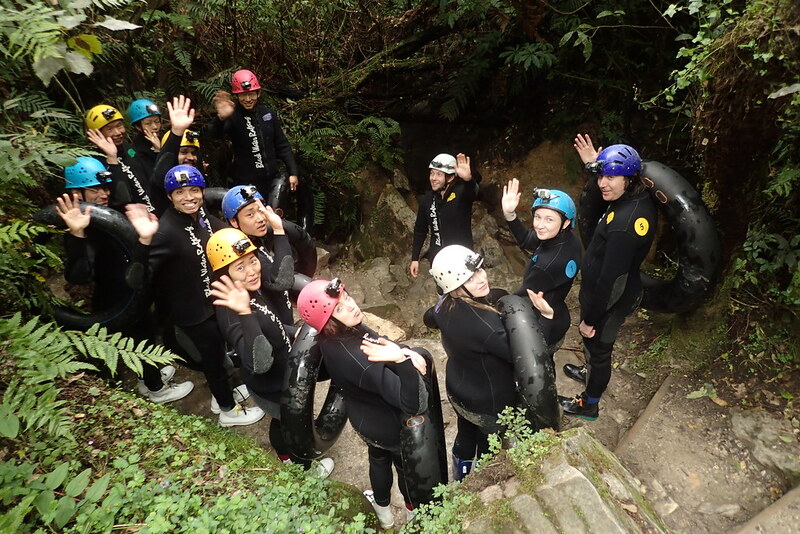 But then we were lined up along a river bank, facing a high wooden platform over the water, and told we were going to practice jumping backwards on our rings into the water, before doing it for real in the cave. What?! Panic visibly swept across everyone’s faces. When I’d read ‘waterfall jumping’ on the website’s description I’d never imagined that we’d be doing it backwards, or from such a height! The prospect was scary enough here, outside with lots of space and light to see by. What would it be like in a narrow, dark cave? We took it in turns to attempt the jump, some with more success than others. We were told to go for distance not height, so that we wouldn’t hit any rocks (how reassuring… not!) On my turn I plunged completely underwater, and had only just enough time to squeeze the water out of my nose and start breathing again before I had to grab onto a ladder or else be swept downriver. This was not a good start. And then it was time to go into the cave. There were more photos taken as we went inside. I look happy on the photos below, but believe me, I was scared! 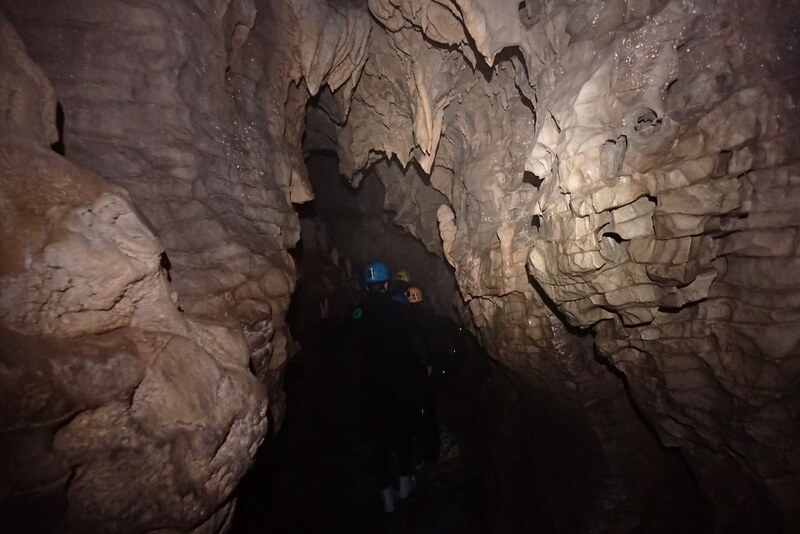 The cave entrance was steep, narrow, and surging with water. Carefully stepping down from one uneven rock to the next, it became darker and darker until the only light was that from our head lamps. Arranging ourselves on a bank of rock above the water, we were given another safety briefing and posed for another photo. 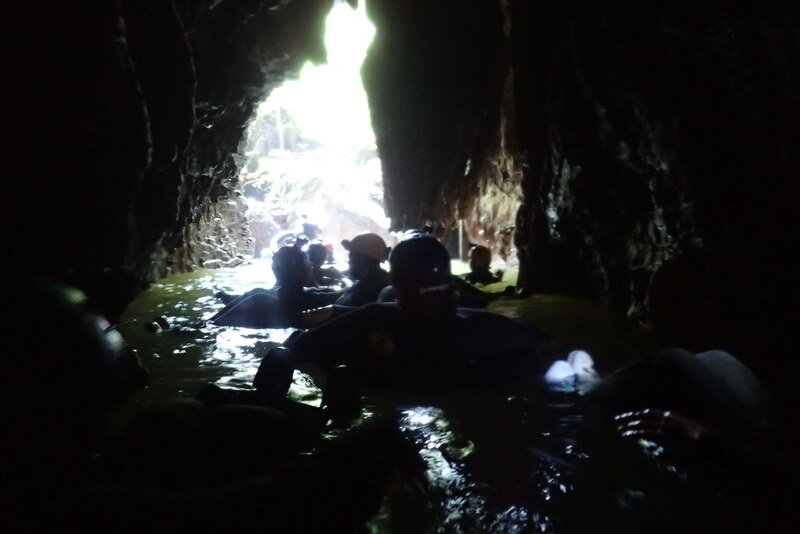 We began wading deeper into the cave, putting all my concentration into putting one shaky foot in front of the other, on whatever solid rock I could find under the black water. Rushing water surged against my legs, and the sound of it crashing over the rocks was almost overwhelming. I felt along the rough wet walls with my bare hands, searching for support, as I felt out every laboured step with my feet – sometimes having to crouch just to reach the next foothold. At one point, the walls were so close together that I practically had to squeeze myself through. I’m not claustrophobic, but at that moment I felt like I might be. 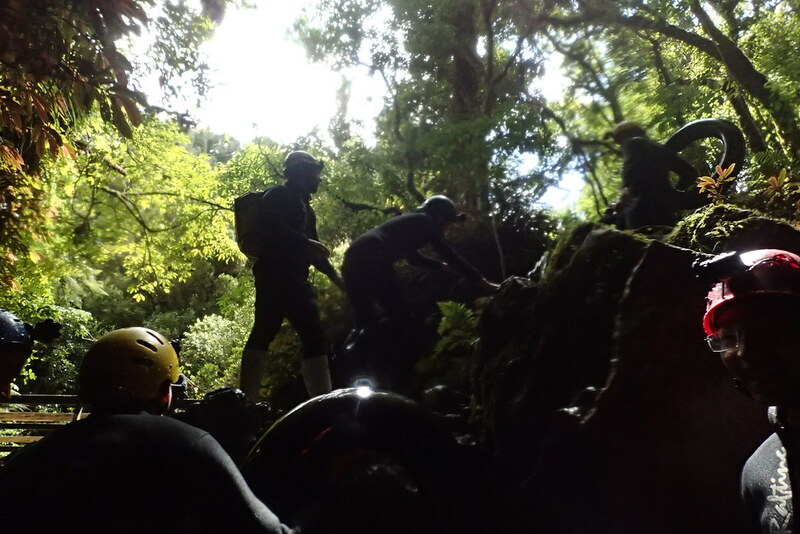 Things came to a head at the end of this first tunnel, where we had to make our first waterfall jump. Once again, the water swallowed me completely and in the darkness it was hard knowing where the surface was. I came up coughing, spluttering and hyperventilating, desperately trying to calm myself so that I wouldn’t descend into a panic attack 65 metres underground. Knowing there were no more jumps from now on, I began to relax and enjoy myself. 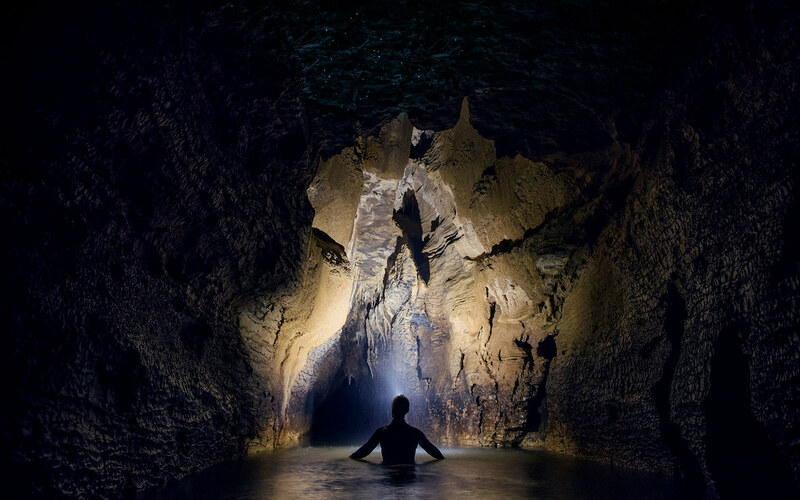 The cave opened up so that the ceiling was much higher and the walls further apart, either side of a calm and quiet underground river. 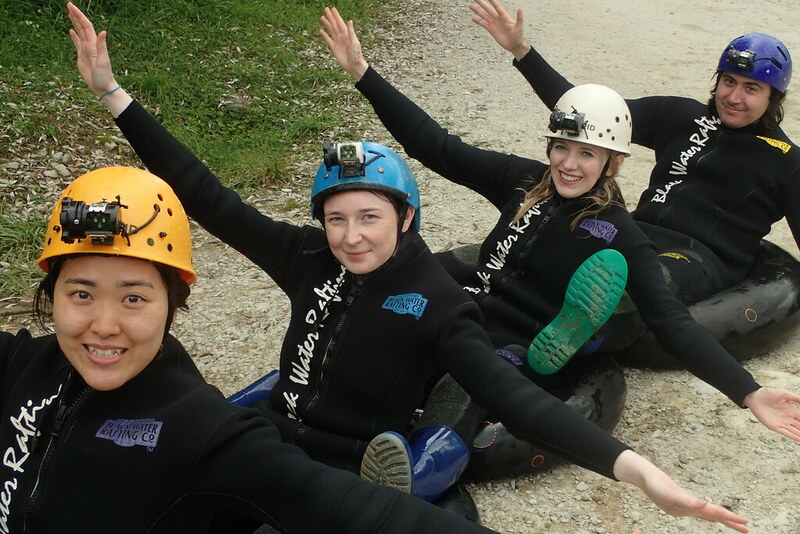 We formed a train where everyone held onto the person behind’s feet, and the river carried us slowly through the cave. The two sets of photos below are from Black Water Rafting Co.’s promotional material, but are a good representation of what it was like. 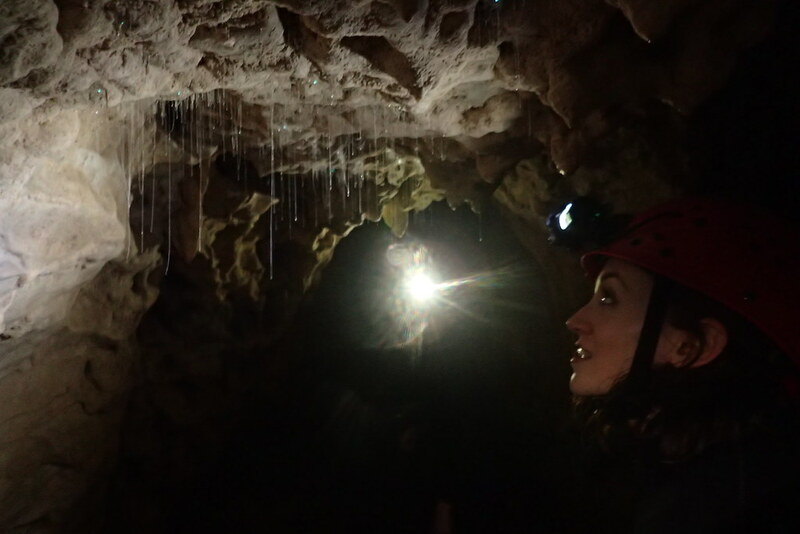 At this point we were told to switch off our headlamps, and in the absolute darkness the glow worms revealed themselves: clustered spots of turquoise-tinged lights, scattered across the cave ceiling and spilling onto the walls like bright stars in the night sky. The sight was truly otherworldly, like nothing I’d seen before. Sailing slowly beneath these ethereal lights on my rubber ring, bathed in the hallowed quiet of the high-ceilinged cave, it felt like I was floating through space. Finally, I felt glad that I’d done this. On we floated, and eventually we were met with the glorious sight of sunlight streaming through the foliage lining the cave mouth. To tell you the truth, I was relieved to have made it out unscathed! Our wetsuits and boots were still sloshing with water as we travelled back to the office. In the yard we were able to peel off our wetsuits, have hot showers and change, and wearing normal, dry clothes has never felt so good! 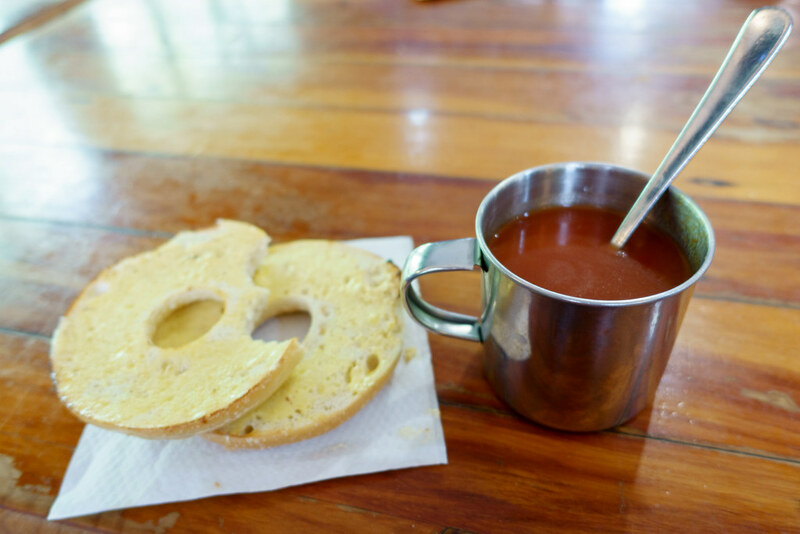 In the café we were invited to help ourselves to toasted bagels and hot tomato soup, but we’d barely started eating these before a bus came to collect Jess, Tama and I. I had just enough time to buy a USB stick of the photos before jumping in. 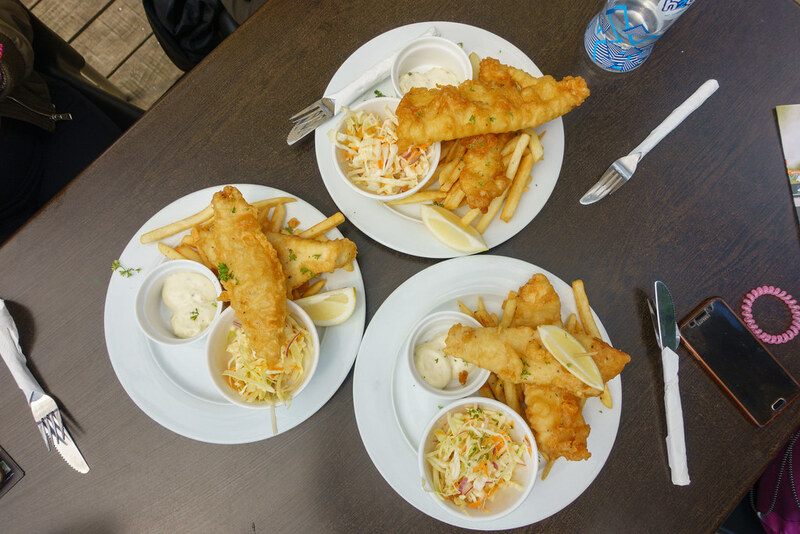 The bus took us to the Waitomo Caves centre, where we used the vouchers we received at Black Water Rafting Co. to order fish and chips in the café. It was really good – except for the grave error of serving it with dry slaw rather than mushy peas. We browsed the gift shop before getting on the Intercity bus to Rotorua. If that sounds good to you, go ahead and do Black Labyrinth. 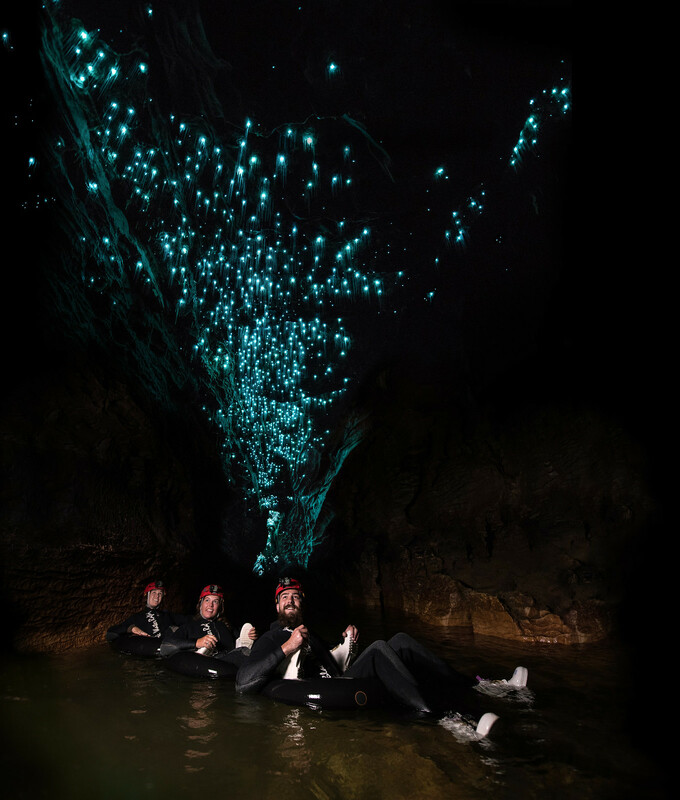 But if you’re not into that there are much easier, more relaxing, and cheaper ways to see the glow worms! 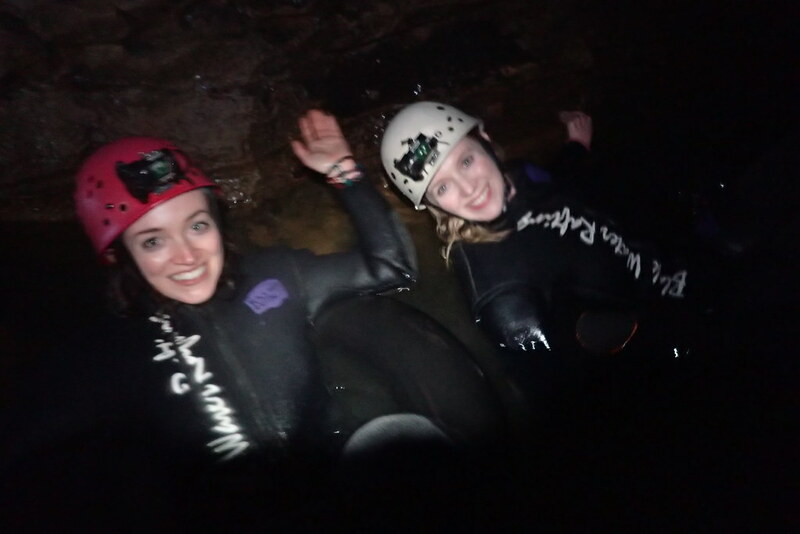 Let me know in the comments if you’re thinking of venturing into the caves yourself, or tell me about your experience if you’ve done it! Disclaimer: most of the photos in this blog were taken by Black Water Rafting Co. because we weren’t able to take any photos ourselves. Food photos are my own. 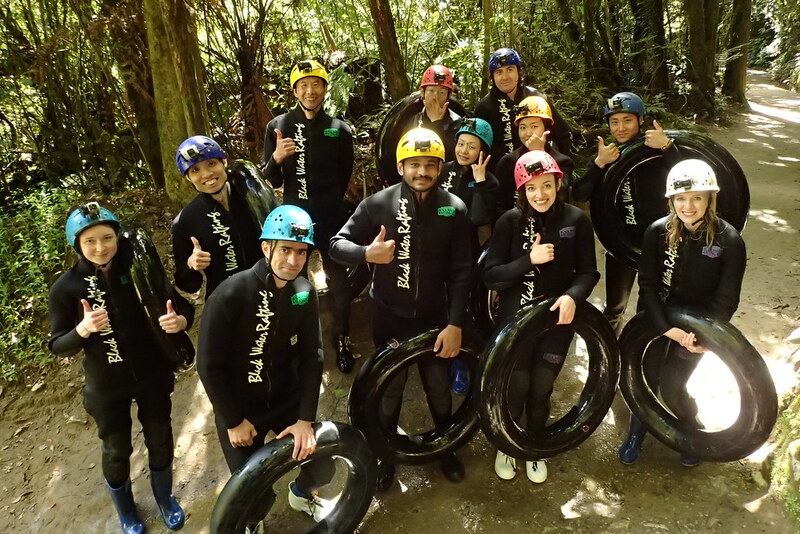 Posted in New Zealand, Reviews, TravelTagged Black Water Rafting, glow worms, ruakari cave, waitomoBookmark the permalink.